You'll find plenty of places to visit near Patong: Chalong (Chaithararam Temple (Wat Chalong) & Phuket Big Buddha). And it doesn't end there: enjoy the sand and surf at Patong Beach, stop by BS Fashion, tour the pleasant surroundings at Kata Beach, and see some colorful creatures with a scuba or snorkeling tour. To find where to stay, more things to do, other places to visit, and other tourist information, refer to the Patong trip maker site . London, UK to Patong is an approximately 17.5-hour flight. You can also do a combination of flight and bus. The time zone changes from Greenwich Mean Time to Indochina Time, which is usually a 7 hour difference. Prepare for much hotter weather when traveling from London in March: high temperatures in Patong hover around 39°C and lows are around 27°C. 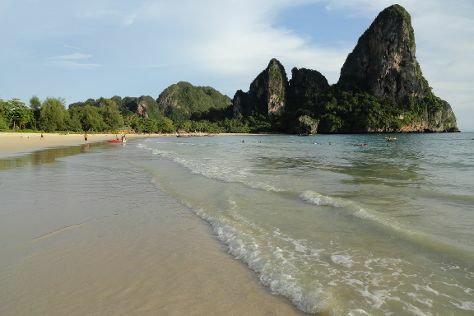 Finish up your sightseeing early on the 19th (Tue) so you can go by car to Krabi Town. Start off your visit on the 20th (Wed): tour the pleasant surroundings at Railay Beach, kick back and relax at PhraNang Cave Beach, and then stop by Armani Collection. Here are some ideas for day two: hike along Tab Kak Hang Nak Hill Nature Trail, then enjoy the sand and surf at Ao Nang Beach, and then take in the spiritual surroundings of Tiger Cave Temple (Wat Tham Suea). Before you visit Krabi Town, use our trip planner to discover what you can do and see there. Traveling by car from Patong to Krabi Town takes 3 hours. Alternatively, you can ride a ferry; or do a combination of ferry and bus. Expect a daytime high around 41°C in March, and nighttime lows around 26°C. Wrap up your sightseeing on the 21st (Thu) to allow time to travel to Lucknow. On the 22nd (Fri), don't miss a visit to Victoria Memorial, admire the landmark architecture of Constantia House, then explore and take pictures at La Martiniere College, then admire the landmark architecture of Bara Imambara, and finally stop by Ada Chikan. To find other places to visit, maps, and tourist information, refer to the Lucknow road trip site . You can do a combination of bus and flight from Krabi Town to Lucknow in 9.5 hours. Another option is to drive. The time zone difference moving from Indochina Time to India Standard Time is minus 1 hour. Prepare for a bit cooler weather when traveling from Krabi Town in March: high temperatures in Lucknow hover around 37°C and lows are around 17°C. Wrap up your sightseeing on the 22nd (Fri) early enough to travel to Pune. Pune is known for historic sites, museums, shopping, nature, and parks. Your plan includes some of its best attractions: contemplate in the serene atmosphere at Dagadusheth Halwai Ganapati Temple, browse the eclectic array of goods at Phule Market, admire the striking features of Shinde Chatri, and tour the pleasant surroundings at Koregaon Park. For ratings, maps, where to stay, and other tourist information, go to the Pune trip planning app . Getting from Lucknow to Pune by flight takes about 3 hours. Other options: do a combination of flight and bus; or drive. Finish up your sightseeing early on the 25th (Mon) so you can travel back home.